Verbal is a section which most engineers dread as they trust themselves with the quantitative and logical reasoning, at least for the knowledge part. However this is the section where many find themselves lost amidst the mirage of word lists, variety of suggestions and convoluted procedures to mug vocabulary. However, what is required is a systematic approach towards preparations for this section based on ones strengths and improvement areas. Once such an analysis is done, one would realize that this section isn’t as conundrum as it may seem on first look. What I have tried below is to divide the section into three types of questions that are generally seen in it and talk about tackling each type of questions independently. A lot of questions in the CAT’s verbal section are about reading and understanding rather than knowing. This is where they use reading comprehensions as the tool. I am not sure about exact number as it hardly matters, but am sure if one sits down with historic data, RC’s would form about 50% of each verbal section, and that would be true across B School exams. 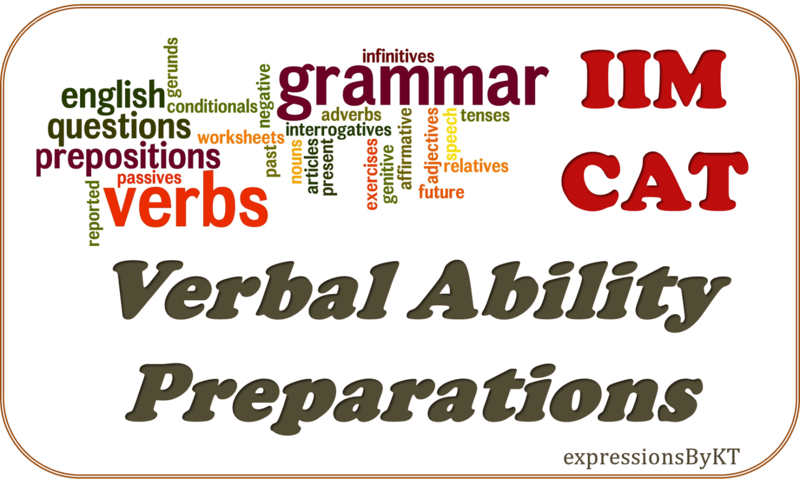 Now, if you would have asked a guide about how to prepare for such questions, one would ask you to prepare for your English knowledge – grammar and vocab – but IIMs have since moved to a different focus. The aim of RC’s today is know whether a candidate is comfortable with English usage and hence the questions try to judge you on your understanding of context, grasp of the tone and ability to develop views on what is presented. Now how should one prepare for it? Here is the two step mantra to learning to handle the RCs. Reading - First and foremost that one would suggest is to read – and read a lot! And while there are many who would recommend editorial pages of Hindu or specific Shakespearean fictions – and they definitely do help – it is important to start somewhere rather than to be bogged down in convoluted language of these sources. I would say that to start with, even a read of TOI (yeah call it entertainment) is good to get into practice of reading. But then it should be critical reading where at the end of it you have the entire context of the story and a firm view on it. As you get deeper, you should start reading articles across topics including sociology, psychology, philosophy, economics and other non-glamorous areas. This is important because it is not enough to be able to read but to be able to read boring topics without lethargy and with concentration. I would say that starting whenever you decide to take a shot at CAT; you should start devoting 30-45 minutes to reading. Well reading news is important anyway in life so why not start now. Practice – As I have recommended in each area for CAT, practice is as important in this area as well. As you begin reading, you also need to get in habit of assessing the content and this comes through the questions that practice RCs throw at you. Practice is also the time when you decide on the best strategy for attacking your RCs. There is a different strategy for everyone. Broadly all of them lie between questions first or passage first or somewhere in middle of it. While former says to read your questions first and then to get to the passage, later is about reading and absorbing the passage first and then moving to questions. There are those who balance between these by putting different amount of focus and time to each of the phases. What worked for me was a very quick scan at questions first to know what the RC aims to extract out of me and then move quickly to scan the passage depending on type of questions. While reading the passage, make a mental note of sections which would answer your questions and then use this mapping to put down the responses. Again, this worked for me and you need to device your own strategy. I would say practice 5-6 RC passages every week – with 2/3 in one sitting – apart from the mocks that you would take. As the usage of English becomes focus of the exam, one must realize that just knowing the rules of the game is not enough. It is equally important to apply those rules and hence while one has to begin with knowing the technicalities of English language, the practice ends with operationalizing those rules in everyday life. Here are some ways to tackle this challenge. 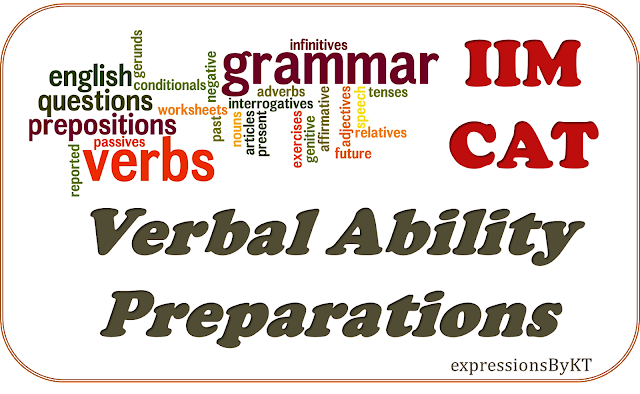 Learn – First and foremost is to know the rules of English grammar and be familiar with the language. I have seen people benefit immensely with the secondary school books – Wren and Martin – being the favorite. One revision of the language rules learned in high school does help you get started and hence should not be skipped. Listen – Listening English language is best way to develop your sense of the language. As you listen to the right sources you start developing a subconscious understanding of where a particular sentence is correct or not. Haven’t you noticed that people say – there is something fishy in this line though they are not sure what it is; the sentence simply sound weird. This is first step to knowing the language or correcting its use. Use – Start speaking in English, atleast with friends. It would help you build a basic sense and improve your sentence structures and usage of the rules. If you have a friend whom you believe has a good knowledge of English, use him/her to throw your language at and ask him to point out at any grammatical mistakes you make in your usage. Also, if you can, try and get into habit of writing a bit – anything – blog, articles for newspapers, SOPs for exams etc. And get them reviewed by one you consider to be good at English. Practice – For this section, I do not think a particular practice guide is important. The mocks you would take as part of general practice should suffice. If you find the need specific to a particular area, pick up a book (Arun Sharma may be) or practice material from a coaching and spend some time on questions there. Word lists – Though it is not something to lose your sleep over but still a shot at going through a popular word list is definitely worth the effort. Your coaching institute would provide you one or you can find it in any popular preparation book. All it requires is daily coverage of certain number of words and revision of those already covered. Refer to book such as ‘Word Power Made Easy’ and ‘Six weeks to words of power’. Both these books are pretty effective and are highly recommended. You can browse a sample of Word-Power’s method here, in our Word Power Blogs. Use – Instead of just mugging up the words, one must try and use them in daily life. It is only when you use the learnt words that you absorb their context and usage. Also again, writing helps most in this aspect and if possible, gets into habit of writing. Also when you interact with friends or read books and come across a word you do not know the meaning of, feel free to ask around or check in dictionary. You may understand the word broadly through context but knowing actual meaning is a necessary too. So this is another set of gyan pointers from this blabbering being and I fully intend to absolve myself of all liabilities through this disclaimer!! All these are simply based on my preparations quite some time ago and I have no experience of teaching or anything. These may take your time more than they may help you so feel free to ignore this post – what if I give this disclaimer at the end which you would read after anyway wasting that time :) In case you have more tips and tricks, do add them to comments section for benefit of all. And as always feel free to shoot any questions you may have.